To use it : Right click over a loaded preview, select Misc tab then Edit. Note 1 : AviSynth must be installed ! - Left listview displays function names (double click a function name to add it to the editor). - Right side is the editor itself. "?" : First control will open your default internet explorer showing informations about the function selected in ListView. All funcs / Audio / External / Files / Info / Other / Video : Lists the type of function you are looking for. (Select All Funcs to get a full list). "Add" : Will add selected function in the editor. (You may use double click too). Converter : Will use the converter defined in prefs. Converter X : Will stop converter process. Player : Will use the player defined in prefs. Player X : Will stop player process. Preview X : Will close process and reload it in its default state (without script). Current preview can be defined using combo placed on the right. 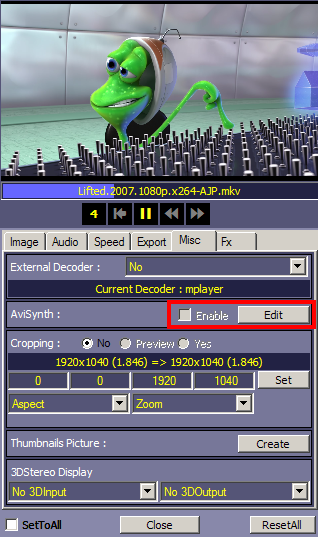 Aspect : Is only used by Preview (not converter, not player). Source : This is where the source file is taken, it can be any preview. Preset : those are example scripts, they can be applied to any preview. Add : Checked = Will add script to current, Unchecked = Will replace current script. Add : Adds a script from disk. Save : Save current script to disk.